Real Madrid - Bit of this and that | The Real Madrid Fan! There has been some time since the last post so this would be a combination of many thoughts and happenings at the club. Pablo Sarabia who debuted under Jose Mourinho in December for about 20 minutes has moved to another Madrid based club in the form of Getafe. The talented midfielder has signed a five year contract and was officially unveiled today (Monday 11 July). As per the agreement, Real Madrid can sign him back after 2 years with a fee of around €6million. Getafe on the other hand have signed him reportedly for €3million. Juan Carlos Perez was the first Canterano to debut with the senior side this season, making an appearance against Deportivo La Coruna in the league. He was Castilla’s top goal scorer in 2009-10 with 11 goals in 29 games and now makes a move to Real Zaragoza. He has joined for a fee of €2.5 million and like Sarabia, Real Madrid have a buyback clause in his contract too. Real can sign him back within the next two seasons for €3.5 million. Mateos was given a professional contract in 2010/11 having been part of Castilla in the past. Thereafter he made two appearances with the senior side. With limited options, he joined AEK Athens in the January window where he made 9 appearances. The Greek club had the option to extend the deal for another year but opted not to. 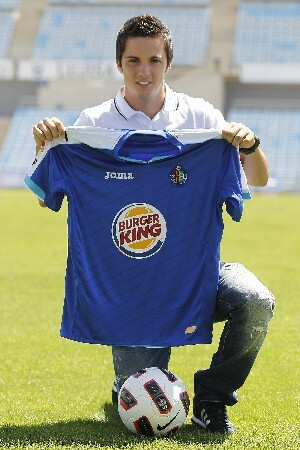 Now in the summer, Real Zaragoza have signed him as a loan deal but now for the full season. These three are perfect examples of how everything is going wrong at the club in terms of youth development. There are €30m being spent on players (Coentrao, more on that up ahead) and nothing is being done to give the youngsters the opportunity to be part of the progress of the club. There have been numerous players who have been part of our youth setup but ended up playing elsewhere and making a mark there too. Names like Negredo, Parejo, Mata, Soldado and Valero come to mind. I agree not everyone can get the opportunity to play for the senior side and there is too much pressure to perform each and every week but you’re not really the best manager in the world if you can’t blend in the two. I am very happy for Sarabia who would hopefully get first team football which he totally deserves. Also, Morata has his contract extended so thankfully there is good news amid all the exits. Some weeks back, Gago, while in Argentina preparing for the Copa America, was a guest on a show called Pura Química on ESPN Argentina. He was obviously asked about Real Madrid and the rivalry last season versus Barcelona to which he was reported to have given some controversial answers such as “Barcelona are the best team ever. They are over Real Madrid and the fans think they can win but this year it was impossible. Fans won’t realise this because they won’t admit it.” (For full news report on Eurosport in Spanish or MSN in English) This caused a huge outburst on Twitter and other places, which is quite an obvious reaction by Madridistas. Fans called for his head, said some unthinkable things, wanted him to be transferred really quickly etc. Later, a clarification tweet by a viewer in Argentina showed how it was all taken out of context. Gago meant something else completely while the media in Spain and everywhere else reported something else. This shows how flimsy we are when it comes to such reportage and news from the media. We tend to use our intelligence when it comes to transfer rumours (well most of us do!) on a daily basis, so what happened in this case? Its known that media outlets need to make up stories to sell more, the spicier the news, the better the bling that it brings but would they go to such extent if we didn’t go crazy over such things as well? Admittedly, in this case, I called for Gago to be sold ASAP too but having understood the actual situation later, I felt bad for the Argentine. He would be sold or loaned for sure this summer and this wasn’t the deciding factor for that in any case. So for people that believe Gago did this intentionally to get him sold, you’re probably reading this wrong. After weeks (probably months) of rumours, discussions and U-turns, Benfica’s Portuguese left back Fabio Ceontrao completed his move to the Bernabeu for a fee of €30million. Thus becoming the second most expensive defensive signing behind Rio Ferdinand (Leeds United to Manchester United in 2001). He signed a contract for the next six seasons (until 2017). I have seen Coentrao play for Benfica in the Europa League. He’s a good player defensively and his quick feet allow him to be fantastic in attack as well. But the signing raises two key questions - With Marcelo having an exceptional 2010/11 campaign, was Coentrao needed at all? And second question, who would be the permanent starter? I do think Marcelo can be caught out defensively at times but he’s vastly improved on that front. In the past, his defensive abilities (or lack of them) would have been a huge concern on the left side, especially when facing a quick counter attack but now Marcelo does a brilliant effort to get back in position or with the support of his team mates avert danger. So, this in my opinion, was a deal which wasn’t needed. You could quite possibly count him as a backup option, which brings me to the second question. Even if we do think we needed Coentrao, did we spend €30million on a player who would be the second choice and quite possibly would be warming the bench? In case he becomes the first option, that’s completely idiotic on Mourinho’s part to ignore the efforts of Marcelo who was the most improved of our players last season. The Pre-Season is finally on! The players assembled at Valdebebas today and then flew off to Los Angeles for the US tour after meeting each other, hearing Florentino Perez speak and getting their medical done. Once there, the team would start training on Tuesday (10AM local time, 7PM in Spain) at the UCLA Campus and would be staying at Beverly Hills Hotel like last year. Canteranos in these are : Mejias, Jesus, Casado, Nacho, Jese and Joselu. Absentees are Fernando Gago, Higuain, Di Maria who are in Argentina for the Copa America, Sergio Canales who would be staying back in Spain to prepare for the U-20 World Cup, Altintop who is in recovery from his recent surgery. Pedro Leon, Royston Drenthe and Lass would not be travelling due to a technical decision, which means they are to be sold or loaned. New sporting director at Real Madrid - Zinedine Zidane would be travelling too along with Emilio Butragueno, director of institutional relations.